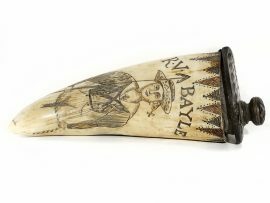 “Whaler at Sunset” black and white scrimshaw on ancient walrus tusk ivory artifact by Gerry Dupont. Excellent depiction of a whaler serenely sailing along in a glorious sunset. The colors of the ivory inspired the title. This rare piece of ivory was used as a net sinker hundreds of years ago by natives in the Northern Bering Sea area. It is in excellent condition as all of the holes drilled into the ivory are completely intact. Rare.